In response to multiple inquiries about a customized version of the background, I’m making the original .PSD files used to create the files available in 8.5×11 and 16×20 sizes, both high res. A little more pricey but still a lot less than on stock sites. Check ’em out here. Who knew that a Saturday afternoon inspiration would translate into over 100K Pinterest repins? Last September I joined a group board on Pinterest called Hand Lettering Practice. It was just the excuse I needed to do more hand lettering, a passion of mine since childhood. 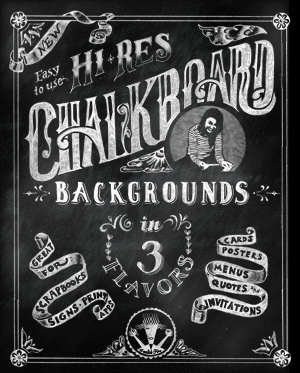 Along with a good part of the lettering community, I also became quickly addicted to the chalkboard technique, and after some experimenting in Photoshop, came up with a pretty easy way to “fake” the effect without actually using “chalk” and a “board”. Yeehaw!! So I created some Free Photoshop Background Files, a tutorial on how to do the layering, scanning, etc. and another Tutorial called A Beginners Guide to Spiffing Up Your Hand Lettering. These three posts have been surprisingly popular and I’ve received lots of comments and questions, especially on the topic of how they can be used for specific projects and whether it’s okay to use them for commercial uses. In other words, if you stay under 8.5×11, they’ll look “okay”, but they’ll print out pretty much like something downloaded from the internet, which can be disappointing. So it occurred to me that maybe folks might appreciate being able to use these same backgrounds at a higher quality/resolution for use in print applications, scrapbooking, signs, invitations, etc. and so here they are. Three high-quality .jpg files in black, blue and green at 300 dpi. I am asking $1.99 for the download, however. Only because similar chalkboard background files on stock photo sites can cost as much as $20.00 (and since Foolish Fire is not my day job, all this stuff does take some time away). So, if you can make the lo-res versions work for your project, have at it. But if you need better quality, I invite you to purchase these 300 dpi, 8.5×11 versions. The same techniques apply when using the hi-res backgrounds with scanned artwork or chalkboard fonts or your own machine set text. You’ll just be working with bigger files, thus anything you scan or layer over these base files should also be at least 300 dpi to get a 1:1 ratio. You may also note the color is a little less saturated on the higher res versions. Since these are intended for print eventually, I’ve created them in CMYK color space, instead of the RGB for the lo-res versions, which are intended for screen use. RGB color is a bit brighter on the screen. As always, I hope you enjoy these files and they become a helpful addition to your artistic tool box. Please contact me if you have any trouble with the download process. Note: Once PayPal verifies your payment, you’ll receive an email containing the download link. Thank you for your patience as this may take several few minutes. Please contact me if more than an hour has passed and you’ll still haven’t received the download email. i made the payment through paypal, now how do i download?? I want to use these as a background for a print that is 16″x20″. Will they print okay? Just bought your chalkboard backgrounds, and excited to use them. An idea…I think you should have your Paypal Checkout pop up in a NEW window, so that your site is still available without backing out through paypal. Try Creative Market. 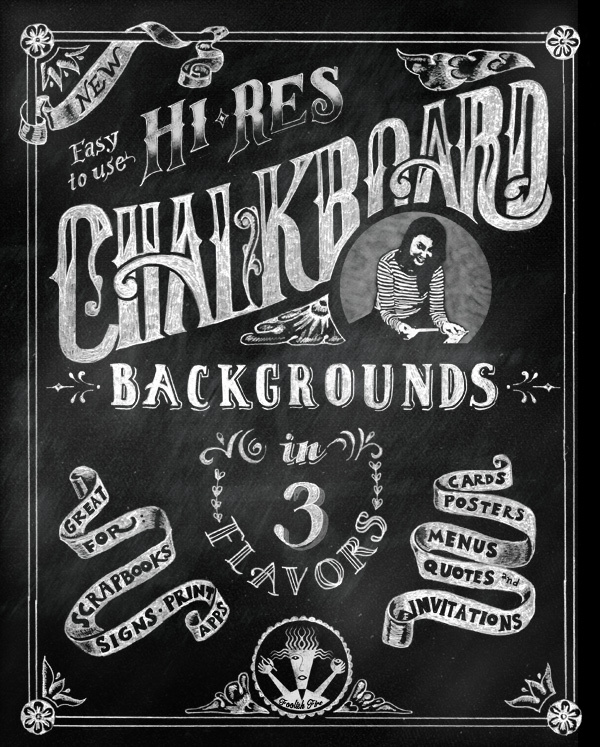 They have a ton of downloadable vector artwork for chalkboard, plus fonts, etc. I would like to know the name of the font used on this chalkboard. The actual CHALKBOARD word. It’s fabulous you do great work! Thanks for the compliment. The CHALKBOARD “font” isn’t really a font…or at least it isn’t machine set type. It’s loosely based on Davida Bold but it’s all hand-drawn so I took liberties.